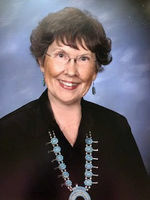 Martha Joy Miller Bell passed away peacefully at home on Friday, February 1, 2019 at the age of 84. She was born in Enid, OK in December 1934 to M. E. Madge Miller and H. Lee Miller. She was preceded in death by her parents and grandparents. Joy graduated from Capitan High School and went on to earn a Bachelor’s Degree at New Mexico State University. She has been a member of the Delta Zeta Sorority for over 50 years. Joy was also a member of Order of the Eastern Star for over 50 years. Joy was elected Mrs. New Mexico in 1969 and placed Second Runner Up at the Mrs. America Pageant that year. Joy was then elected to be Mrs. U.S. Savings Bonds for 1969-70. During her tenure as Mrs. U.S. Savings Bonds she visited U.S. troops in Viet Nam. She has been included in the Women’s Who’s Who publication for many years. Joy enjoyed her time as a school teacher and later went on to become a Certified Financial Planner and Real Estate Broker. Joy was active in a number of organizations including the Humane Society. Joy is survived by her husband, Donald R Bell; son Richard Berlemann and wife Valerie; son Lee Berlemann and wife Stephanie; two grandchildren; stepchildren Jeri McDowell and husband Jim, Johnna Luther and husband Gary, Mary Bell, Charlie Bell and wife Christine, Nolan Bell and wife Christina; 15 step grandchildren and eight step greatgrandchildren. Plus, her beloved pets. Joy was a loving and caring daughter, mother, spouse and grandmother. Joy brought fun, laughter and an air of elegance to all around her. Her presence will be missed by everyone. Joy will be cremated and laid to rest beside her parents and grandparents in a private ceremony at Angus Cemetery in Lincoln County, NM. To send flowers to the family of Martha Joy Miller Bell (Miller), please visit our Heartfelt Sympathies Store.